The literate proportion of the British population grew steadily throughout the 19th century. At the same time, paper production was becoming cheaper, and there was a huge boom in the development of fast and efficient printing presses. Books, periodicals, magazines and newspapers were produced at unprecedented rates to meet the growing demand for literature of all kinds. 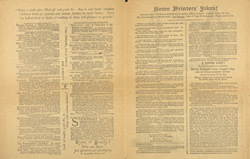 This side of the leaflet advertises a number of books being produced by the Leadenhall Press, among them future prime-minister Benjamin Disraeli's 'Vindication of the English Constitution'.